Last week I wrote about automotive charging systems in general. This week I want to drill down specifically into the BMW 2002’s charging system. But in that era, it wasn’t specific to the model; if you have a 2002, or for that matter any vintage car with an external voltage regulator, like a 2002 or a Bavaria or a 3.0CS, print this and tape it to your garage wall. I don’t say that often—in fact, I don’t think I’ve ever said it. In last week’s column, I made passing reference to the reliability issue of external voltage regulators on vintage cars. I said that since both the alternator and regulator have a plug with three terminals in it, that results in nine possible things to go wrong—three wires, and the three terminals at both the alternator and the regulator ends—that can’t happen on a more modern (post-mid-1970s) car whose alternator has an internal regulator. Actually, it’s worse than that; it’s eleven things. Add to the mix #10: the ancient external mechanical voltage regulator itself is more failure-prone than a modern internal solid-state regulator, and #11: the metal clip holding the plug into the back of the alternator is often missing, allowing the plug to pop out. However, the vintage setup with the external regulator does have one advantage over the more modern, more reliable internally regulated setup: Because the regulator is external, it can be bypassed, allowing you to separately test the alternator without involving the regulator. You can’t do this with a modern internally-regulated alternator because the regulator is integral with the brush pack, and you can’t run the alternator without brushes. Visually inspect the battery-to-B+ connection (B+ is the thick threaded post on the back of the alternator). Clean and re-crimp as necessary. If you need to disconnect it to clean or re-crimp it, be certain to disconnect the battery’s negative terminal first. 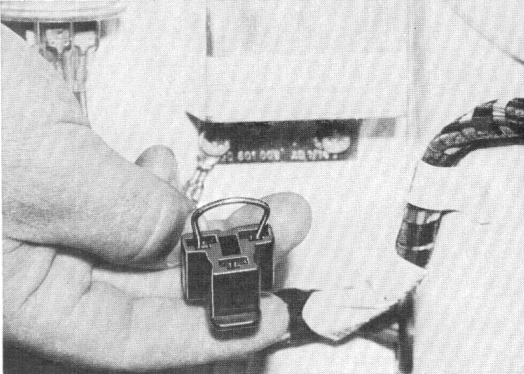 Note that the B+ wire usually vanishes somewhere into the wiring harness, from which it goes to the fuse box; but if you have any question of the integrity of the connection of the B+ terminal to the battery, the B+ terminal can simply be wired directly to the positive battery terminal. Visually inspect the ground connections: battery to ground, battery to engine, alternator to engine. Clean and re-crimp as necessary. 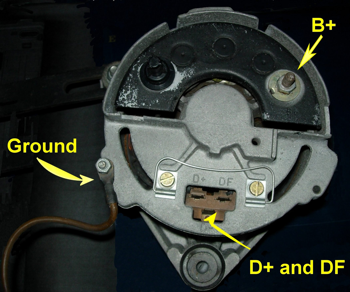 Visually inspect the three connections in the three-prong plug on the back of the alternator—they’re labeled D+, DF, and D- on the alternator body—to make sure that no wires are broken or frayed, and that none of the terminals are pushing out of the back of the connector block. Crimp on new terminals if necessary. Do the same with the same three connections on the bottom of the external regulator. Verify, using a multimeter set to measure resistance, that the three wires between the alternator plug and the regulator plug aren’t broken internally or shorted against each other. Turn the key to ignition. The dashboard alternator light—labeled “L” on a 2002—must come on. If it doesn’t, you must trouble-shoot it to find why. 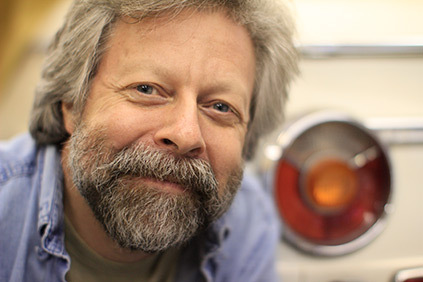 The light may be burned out, or the blue wire to the D+ terminal on the regulator may be broken. This circuit provides the excitation current for the alternator; in order to proceed with alternator troubleshooting, the light must work, although there’s a way to bypass it if it doesn’t. For more information on this, see my Roundel Online article https://www.bmwcca.org/roundel/troubleshooting-alternator-warning-light. Test the resting voltage of the battery with a multimeter. As I said my last few columns, it should be about 12.6 volts. If it’s really low, recharge or replace the battery before going further. Despite what you may have heard, alternators aren’t designed to recharge deeply discharged batteries. If the battery is good and the “L” light comes on when the key is turned to ignition, start the car. The “L” light should go out. Test the battery voltage with the engine running; it should be at least 13.2 volts, and should rise to closer to 13.5 or 14 volts as you rev the engine up to 2,500 rpm. If instead the voltage stays at 12.6 volts with the engine running, or the light doesn’t go out, or both, and you’ve checked all the connections I’ve described, then either the voltage regulator is bad—it’s likely stuck in the bypassed configuration—or the alternator is bad. You need to figure out which one it is. It could be both. You can “full-field the alternator” (that is, bypass the regulator’s switching of the alternator on and off and instead set the alternator to dump current continuously into the battery) by unplugging the plug from the bottom of the regulator and jumping across the DF and D- lines. NOTE THAT THIS MAY PUT OUT AS MUCH AS 17 VOLTS, SO DON’T DO IT FOR LONG! Note also that if you have retrofitted any solid-state electronics into the car, you should not do this test, as the higher voltage may fry it. The jumping is described in the BMW 2002 factory repair manual, but the manual doesn’t really explain that the jumper is full-fielding the alternator; it only says that it should make the warning light go out. Have the multimeter set to measure voltage, with the probes clamped across the battery when you perform this test, so you can see if the voltage increases. If you apply the jumper when engine is idling, and the alternator is working, you should actually hear the alternator load down engine. If, with the plug jumped, the voltage goes up at the battery and the warning light goes out, then the alternator is probably fine—the regulator is probably at fault. Replace the regulator with a new one or a known-good one, measure the voltage with the engine running at the battery, and see if you’ve got charging voltage. But if the full-field jumper test does not load the engine down, does not cause the light to go out, and, most important, does not produce extra voltage at the battery, then the alternator is probably bad. Replace the alternator and re-test. Note that, as was the case with Jeff Caplan’s car that I trouble-shot at the Vintage, both the alternator and the regulator can be bad. In Jeff’s case, it was a newly-rebuilt Bosch alternator and a new Hella solid-state regulator, and they both appeared to be bad. The system charged fine when they were both replaced with good components. There’s more information in my electrical book on performing a voltage-drop test on both the B+ and ground cables, but it’s usually sufficient to visually inspect and clean the connections. There’s also additional information in the book about alternators with internal regulators, but if your car is a vintage car with an external regulator, the test given here is clearer and more concise, since it deals only with the vintage setup. Rob’s first book, Memoirs of a Hack Mechanic, and his new book, The Hack Mechanic Guide to European Automotive Electrical Systems, are available through Bentley Publishers, Amazon, ECS Tuning, and Bavarian Autosport—or you can get personally inscribed copies through Rob’s website: www.robsiegel.com.